On March 18, 1850, the future financial services giant American Express Company was founded by Henry Wells and William Fargo, 2 years before those business partners founded Wells Fargo and Company. Famous today for their credit cards and travelers cheques, American Express rakes in revenues over $33 billion per year, placing them among the 30 companies that comprise the Dow Jones Industrial Average stock market indicating group. American Express started out as an express mail delivery company, a merger of companies owned by Wells, Fargo, and John Butterfield (who co-owned another company with Wells). Headquartered in Buffalo, New York, Butterfield objected to expanding the business to include deliveries to California, causing Wells and Fargo to start Wells Fargo and Company in 1852. Both companies flourished. 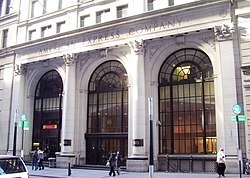 American Express soon moved its headquarters to New York City where they maintain their headquarters today. The company prospered so well that they built a new 10 story building in 1891, a tall building for those days. By 1903 American Express ranked only behind National City Bank of New York among New York financial companies in assets, boasting $28 million. A new 21 story skyscraper was built to house the growing company in 1916-1917 at 65 Broadway. American Express had started into the financial services business way back in 1857, an aspect of the company that allowed for massive growth, resulting in mergers, acquisitions and arrangements with other companies. The impetus for expanding into financial services was to provide competition with the US Post Office’s money order business. An iconic company product, the Traveler’s Cheque, was created in 1890 when a company executive had trouble with his credit in Europe. The business of transportation also prospered, so much so that American Express became a target of anti-monopoly reformers because of their hold on the railroad transport industry, causing a spin-off company, American Railway Express Agency, to be formed. In 1958 American Express finally joined the credit card business, with a massive initial issuance of 250,000 cards even before the official (October 1, 1958) launch date. The paper credit cards were soon replaced by the familiar plastic variety, and aggressive tactics whereby American Express would give discounts to retailers that would only accept American Express cards and not competitors (such as Visa, Discover, and MasterCard) generated allegations of unfair practices. Today American Express credit cards account for about 29% of US credit card business, and well over 100 million American Express cards are issued world-wide, nearly half in the US. Financial services have evolved into many aspects of money handling. Today American Express is the 25th most valuable company in the world, with assets of over $181 billion and 55,000 employees. Average yearly charges on each card are over $17,000. The company logo is an ancient warrior along the lines of a Centurion or Gladiator, reflecting the historically aggressive marketing nature of the company. Grossman, Peter. American Express: The Unofficial History of the People Who Built the Great Financial Empire. Random House Value Publishing, 1987. Mandel, Lewis. Credit Card Industry: A History. Twayne Pub., 1990. Next Article March 19, 1954: Who is the Greatest Pool Player of All Time?